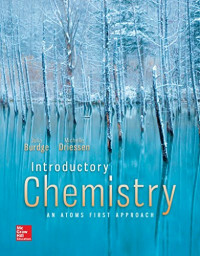 From its very origin, Introductory Chemistry: An Atoms First Approach by Julia Burdge and Michelle Driessen has been developed and written using an atomsâfirst approach specific to introductory chemistry. It is not a pared down version of a general chemistry text, but carefully crafted with the introductoryâchemistry student in mind. The ordering of topics facilitates the conceptual development of chemistry for the novice, rather than the historical development that has been used traditionally. Its language and style are studentâfriendly and conversational; and the importance and wonder of chemistry in everyday life are emphasized at every opportunity. Continuing in the Burdge tradition, this text employs an outstanding art program, a consistent problem-solving approach, interesting applications woven throughout the chapters, and a wide range of end-of-chapter problems.